A 7 month old boy has suffered with eczema for at least three months. It was all over his body, including the trunk, all four limbs and face. There was no flexural surface preference. On examination, there were areas of dry, lichenified skin. There were no blisters, crusts or vesicles. He was initially managed on aqueous cream as an emollient, with Oilantum Jr as a soap substitute. His flares were managed on eumovate BD for up to 2 weeks at a time for everywhere apart from the face, where hydrocortisone was used instead. After the two weeks of steroid would finish, his condition rapidly returned. During the flares, he would itch frequently so was given chlorphenamine for night time relief. The parents arrived at the GP clinic wondering what else could be done. I’ve tried to find the ICE behind the questions in true GP VTS reflectionophilia. Every time the steroids stop it comes back. It’s not getting anywhere is it? Do you think we should see a specialist? Likely patient expectation: Eczema can be cured if only we used the right treatment. A dermatologist could offer the treatment to cure it. Message to get across: Eczema is a relapsing remitting condition. The aims of treatment are to reduce the frequency of flares and also to treat flares quickly. It’s pretty hard to cure it altogether, but the good news is that most children tend to outgrow it as they get older. I heard Aveeno is really good from my friends. Can we have that? Likely patient idea: Aveeno is better than the other emollients. Factors likely driving patient’s idea: Peer recommendation. Also, Aveeno markets itself a bit like the ‘Apple’ of the emollient world i.e. a premium product. It also scents the emollient whereas other companies do not. This means parents get a different feel when they use Aveeno compared to the other emollients. Message to get across: The emollients are pretty much the same. The most significant difference is in the type of emollient e.g. ointment, cream etc. As long as you use it regularly and liberally, it won’t make a difference. One exception: don’t use aqueous cream as a leave on emollient. It probably makes eczema worse. You can use it as a soap substitute though. Likely patient concerns: My child may have eczema that will never go away because we don’t know what’s causing it. 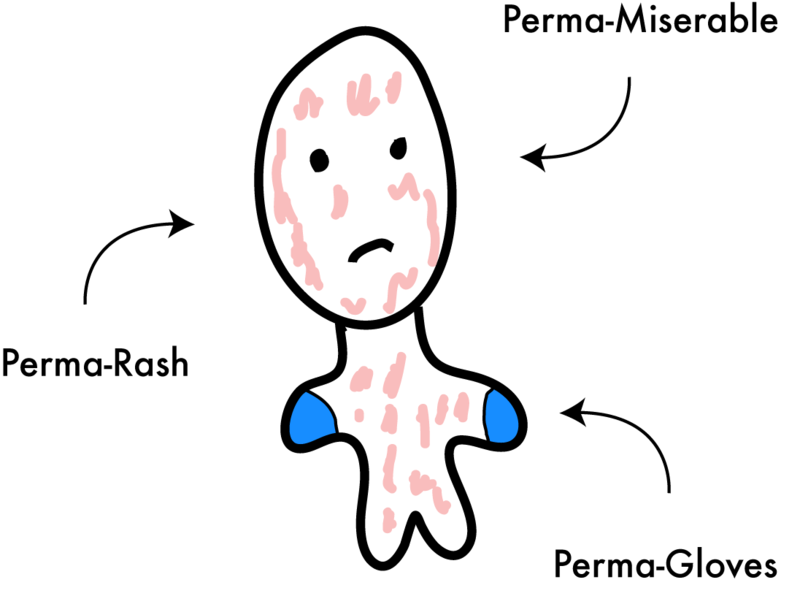 Message to get across: A lot of childhood eczema is now believed to be worsened by staph aureus, both in acute infection flares and by long term colonisation. Eczematous skin is generally more prone to infection (the barrier function is not quite as good as normal). The latest thinking in eczema pathophysiology suggests a role of staph aureus toxins producing crazy levels of IL-31, which drives itch. It may be the case that persistent staph aureus colonisation mediates the development of chronic eczema. For persistent eczema that does not respond well to steroids, or relapses rather readily, look carefully for signs of bacterial infection (blisters, weeping and crusting). This is often the cause of ‘resistant’ eczema. Even if the patient is not showing signs of infection right now, decolonisation may help. At a GP masterclass run by a dermatologist, I learnt that bleach baths are very much in vogue in the US. The instructions are straightforward – about twice a week,for 10-15 minutes at a time. Use ½ cup in a full bath tub (=0.0005% bleach / sodium hypochlorite). It’s best to apply steroids/emollients before the bath, and then emollients again afterwards. The dermatologist who gave this talk herself bleach bathes twice a week simply because it seems to help her skin generally. Read into that what you will. They also said to keep the emollients in the fridge. Is that right? OK, the patient didn’t ask this but let’s say they did to help the Q&A format. As many as 53% of emollient containers may be colonised with staph aureus in a typical paediatric eczema setting. Given that infection (with blisters, crusts and weeping) and colonisation (long term immune response) probably both contribute to worsening of eczema in children, it is worth keeping the emollient clean. If the parents understand this, they are more likely to comply with treatment. I’m going to advise patients to treat it a little bit like contact lens solution i.e. nothing should touch the actual substance in the container. A clean spoon should be used to take it out, and once opened the container should be kept in the fridge. …these blogs are great – keep them coming !